This paleo-friendly recipe turned out beautifully and makes your whole kitchen – and home – smell amazing of garlic, chicken and spices. It’s one of those super easy recipes too which requires little work or monitoring, giving you more time to play scrabble/listen to music/call a friend/paint your toes. I served it with my CSA swiss chard and broccoli and a spoonful of quinoa too and it was a big hit. You can also add any spices you want such as harissa or rosemary or thyme or cayenne. In a large dutch oven, heat the olive oil. 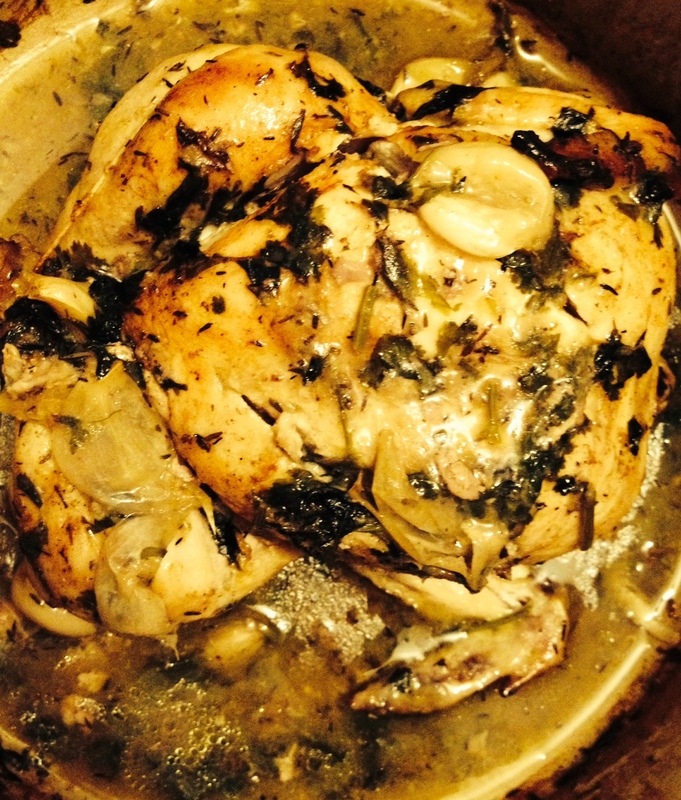 Fry the chicken in olive oil or butter on both sides until golden – this takes only about 5 minutes. Remove chicken from pan and throw away the fat. Add chicken back into the pan and now add your spices, salt and pepper, whole garlic cloves, lemon zest and coconut milk. I like to baste the chicken in the coconut milk too. Remove cover and baste the chicken. Put back in the oven without the cover and cook for another 45 minutes or until the internal temperature reaches 165F. Let the chicken rest for 15 minutes. I like to serve it in the dutch oven because it looks great. You can use the remaining coconut milk mixture in the bottom of the pan as a gravy sauce. Make sure your dinner guests get a piece of mushy garlic too!